This course provides a background in operation and management of limited-ton vessels. Topics include vessel design, cargo operations and vessel management. 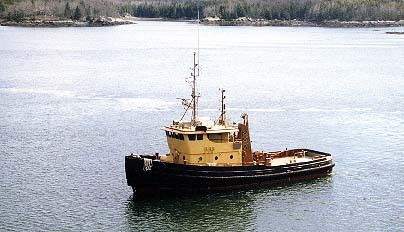 Lab sessions aboard the Tug Pentagoet require students to develop proficiency in all vessel operations.Emphasis is placed on close-quarters maneuvering. During this course, students will develop the knowledge and practical abilities necessary to be a boat and ship handler. Topics include propulsion systems, ship maneuvering, anchoring, docking, emergency situations, ship pilots, ship-to-ship interaction, channel effects and tug use. Classroom lectures and launch and tug use are supplemented by work on the simulator and Schooner Bowdoin. Through this course students will become familiar with basic theory and practice of towing barges. Topics include all aspects of the towing industry, such as ship assists, types and functions of tugs, stability and design, towing theory, preparation, interface with regulatory agencies, documentation, and safety and advanced towing exercises. Instructors are U.S.C.G.-designated examiners and competencies for T.O.A.R. ( Towing Officer Assessment Record) will be certified upon demonstrated proof of skills. Prerequisite: NS 345.